Alexander and I are leaving tomorrow by train for Michigan to visit my sister and her family. So I am packing up for Sauder. 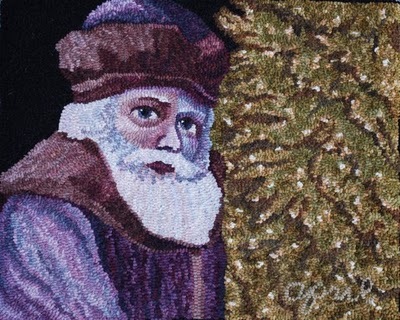 I am taking a few rugs I hooked this last year to exhibit: Saint Nicholas 2009, White Tiger Beauty, Lady Sunset, and my Christmas rug 2010 which I am just finishing. It is called O Christmas tree. Here is a sneak peek. I used wools from the Norfolk family (my blue-purple family). 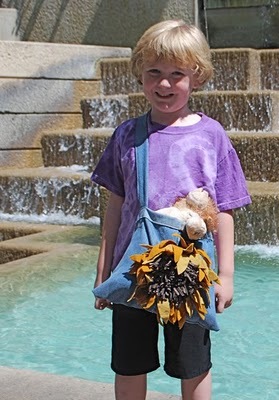 Alexander is going to display his prodded sunflower which I sewed onto a jean sack for him. He carries his sleep buddies in it. I will try to post while I'm at my sister's house, but it won't be as regular. I promise to take pictures at Sauder and post them afterward.